Step one: Decide what you want to make! Do you want to make diapers, stockinette hats and/or mini-blankets? Step two: Request patterns, sewing instructions and get all your questions answered. The form shown below is the way to request your diaper patterns and sewing instructions. Thank you in advance for your patience. Processing these requests can take up to two weeks. Step three: Create your items! Step four: Request distribution cards. These are printable cards placed with each donation. On the card we give you the opportunity to donate your items in memory of a particular person/angel and make sure we recognize your efforts. Step five: Contact our team to determine where your items will go. Each donation is different! Some will go directly to a hospital in need, as arranged and approved by our team. Some will come to our HQ for future distribution. 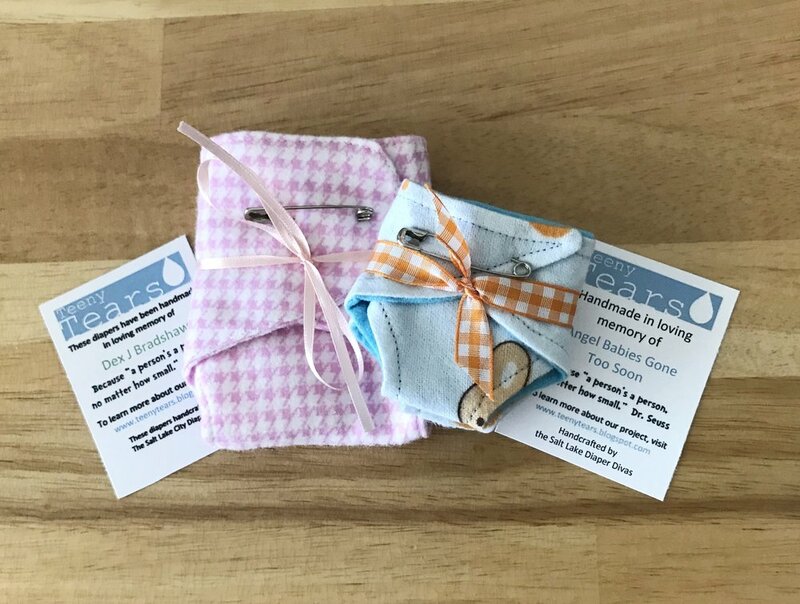 EVERY donation of Teeny Tears items is coordinated by the Teeny Tears headquarters team and ALL deliveries are recorded in our internal database. Step six: Deliver or ship your items! After shipping/delivering your pre-approved items to the designated facility, notify Teeny Tears headquarters so that the donation is recorded as "complete". I understand that Teeny Tears diaper patterns are used EXCLUSIVELY within the confines of the Teeny Tears project. I further understand that Teeny Tears is a centrally coordinated project, that headquarters helps coordinate the distribution of ALL diaper sets worldwide and that Teeny Tears keeps a meticulous record of ALL diaper donations. Complete tutorials on how we create and package all of our items is available by using the "tutorial" link on the menu above. Diapers are found in two sizes and are always donated in matching identical pairs. The small diapers fit babies between 18-23 weeks and the large diapers fit babies between 24-32 weeks. 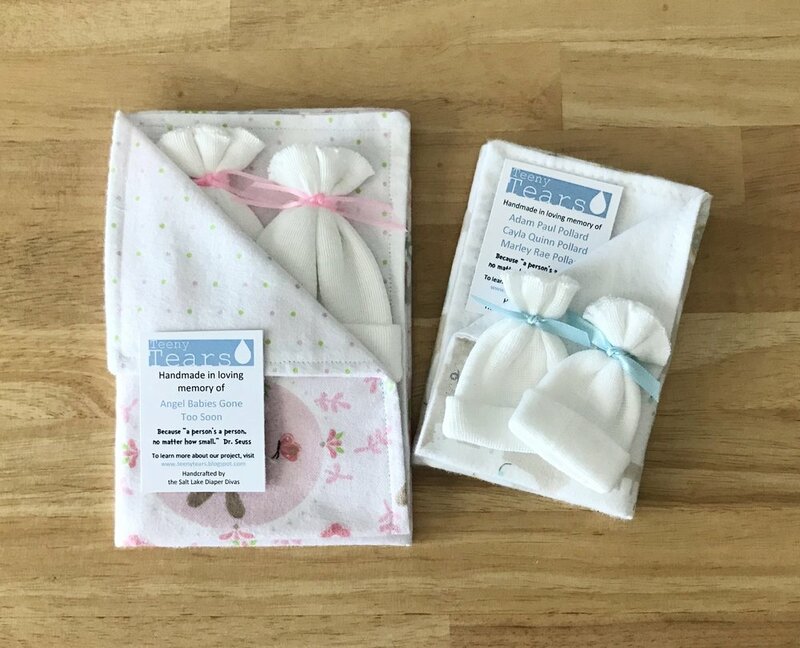 Mini-Blankets are created for babies that are too small for our diaper sets and come with a pair of identical no-sew hats. The small mini-blankets fit babies 14-16 weeks and the large mini-blankets fit babies 17-18 weeks. Stockinette no-sew hats come in three sizes and are donated in identically matching pairs with other Teeny Tears clothing items. Hats are never donated alone to a hospital. We happily accept hats alone at our headquarters, where they will be matched up with other existing items before donation to a hospital in need. Our 2" hats fit babies between 14-16 weeks, 3" hats fit babies between 17-23 weeks and 4" hats fit babies between 24-32 weeks.